Definition: Coil spring specification that measures the diameter in between the spring’s outer and inner diameters. 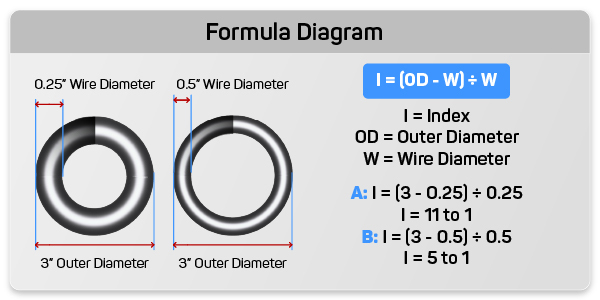 Mean diameter is used to calculate several formulas which are necessary to your design such as index and wire length for manufacturing reasons, or spring rate to know your spring’s force and working loads. Coil spring mean diameter can be measured many ways. It is like your spring’s outer and inner diameters except, instead of measuring from the outside of the coil or the inside of the coil, you will measure from in between these spring dimensions; from the center of the coil’s wire. The formula and diagram to calculate coil spring mean diameter are the following. 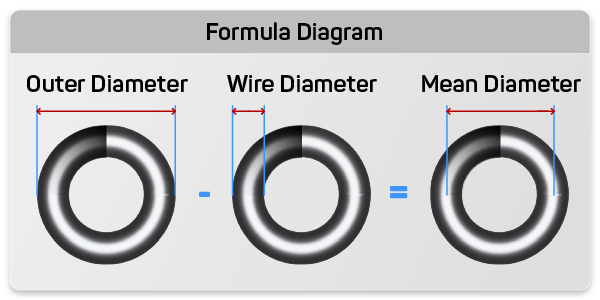 To calculate mean diameter you must simply either subtract one wire diameter from the outer diameter or add one wire diameter to the inner diameter. You have a spring with a wire diameter of 0.035 inches, an outer diameter of 0.500 inches, and an inner diameter of 0.430 inches. Below, you will find the explanations of the formulas in which the coil spring mean diameter dimension is needed in order to calculate an important specification to your coil spring design. 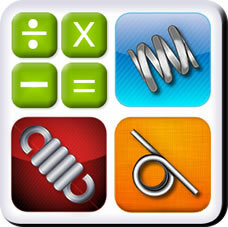 To calculate spring index you must divide the mean diameter by the wire diameter as the formula shows below. You have two springs. Spring A has a mean diameter of 2.750" inches and a wire diameter of 0.250 inches. Spring B has a mean diameter of 2.500 inches and a wire diameter of 0.500 inches. 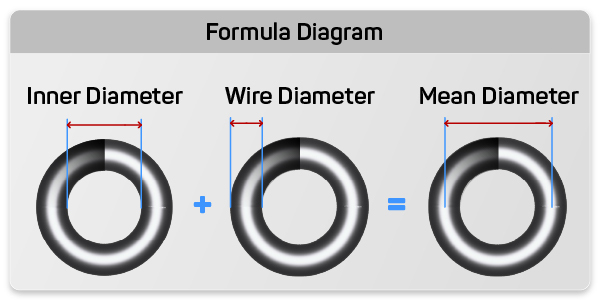 To calculate your coil spring’s wire length using coil spring mean diameter, you must multiply the mean diameter by pi and multiply the product by the total number of coils. You have a mean diameter of 0.465 inches and 10 total coils. 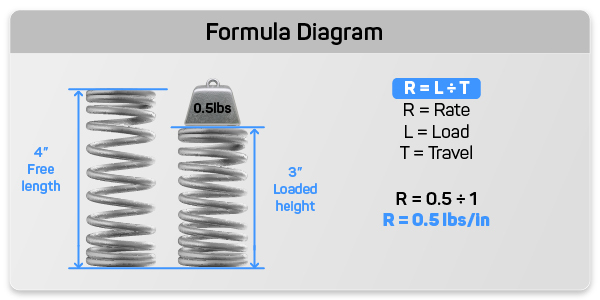 To calculate your coil spring’s rate there are several factors to consider besides your coil spring mean diameter. The formula along with symbol nomenclature is shown below.